HARARE, Zimbabwe (CNN) -- A Zimbabwe Supreme Court judge ruled Thursday that the state can further appeal a decision that would release a top opposition politician on bail. 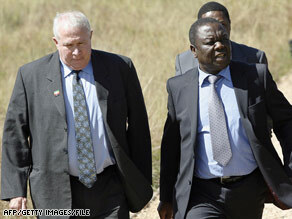 Opposition politician Roy Bennett, left, confers with leader Morgan Tsvangirai last year in South Africa. Judge Paddington Garwe said the state can appeal a high court decision to grant $2,000 bail to Roy Bennett, the opposition's choice to be deputy agriculture minister in the new power-sharing government. State counsel Chris Mutangadura filed an appeal of the bail decision to the Supreme Court immediately afterward. One of Bennett's attorneys, Beatrice Mtetwa, said the ruling was not unexpected. "I am not surprised. Not at all," she told reporters outside the Supreme Court. Bennett, 52, was arrested February 13 on charges of possessing weapons for sabotage, banditry and terrorism. Initially, he also was charged with treason. Last week, Judge Tedious Karwi of Zimbabwe's High Court ordered Bennett released on bail, saying granting the $2,000 bail was "in the interest of justice." Karwi upheld his decision on Tuesday after the state appealed to the High Court. The state contends Bennett is not a good candidate for bail, saying he may be a flight risk. Should the Supreme Court confirm the bail order, the state said it will ask the court to impose stringent bail conditions: raising the bail amount to $5,000 and requiring Bennett to report daily to police and surrender the title deeds to his property. The state said it also will ask Prime Minister Morgan Tsvangirai, leader of the opposition Movement for Democratic Change, to provide title deeds to his property, as he has offered to stand as a surety. Mutangadura said Bennett would remain in state custody pending the appeal. Bennett, a white farmer and an ardent critic of President Robert Mugabe's policies, is being held in jail in Mutare, 186 miles (about 300 kilometers) east of the capital, Harare.